Wow! A bath made of books, doesn’t this sound too far from reality? 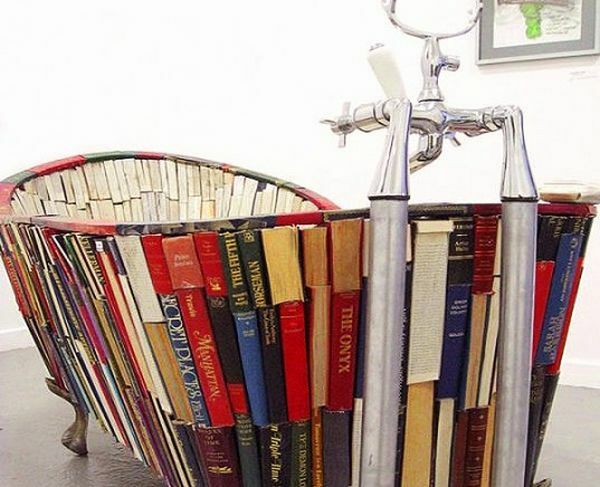 However, it is true; there is actually a bathtub made from some old collection of books. It is designer and artist Vanessa Mancini’s creation and she named it – “Bath of Knowledge.” This artist has put in a great deal of efforts and has cut and fitted each and every book on her own to create this wonder project. She has used four antique shaped bathtub legs on which she rested a metal frame. On the metal frame rests all the books. This is a classic furniture piece that can beautify any modern home. It goes well with the traditional undertone as well. From a distance the piece looks like a bookshelf, and it is only you get near it and touch it that you realize it slides apart. 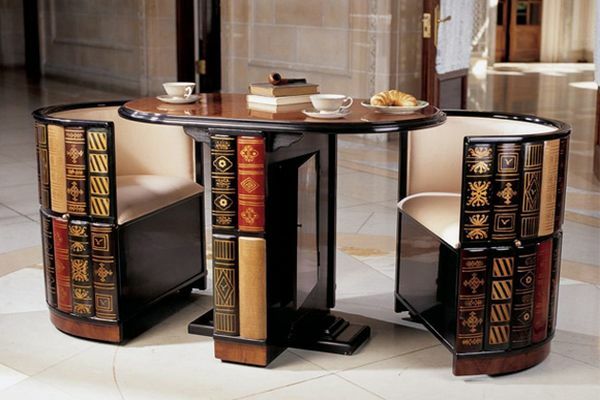 When slid apart, the Nettlestone Library Ensemble becomes a library table with two cushioned barrel chairs. The centre table also has hidden compartments that you can use to put in whatever you want to store. What adds more value to this extraordinary piece of furniture is the fact that it is hand painted and has a stunning lacquer finish burled wood with an ebony trim. Be it your home or office wherever you decide to place this elegant wooden book inspired furniture, which is a smart space saver as well, there would be no dearth of compliments you will get. Button cushion club chair that is fully upholstered has armrests, and the most exciting feature – built-in shelf storage of 27 feet that you can use to store anything from books to CD’s. The seat is very comfortable, it is a deep seat ideal for sitting long hours, and being surrounded by your own small library. It could be a perfect gift you can give someone who loves to be immersed in the world of books and reading. Some of the creative minds have made our lives so interesting and enjoyable with their unique creations.